Hello there, I’m Dean Gootee and welcome to the Dig Through Time series! Like so many readers I started playing Magic: The Gathering at a friend’s kitchen table. I had dabbled a bit in school, but it wasn’t until Scars of Mirrodin block that I was hooked. I quickly discovered that my favorite part of the game was pouring through Gatherer for interesting cards that did really cool things and then figuring out how to build decks with them. I tried getting into Standard (I even built a R/G land destruction deck featuring a playset of Invader Parasite), but I was quickly disappointed that the flashy cards I liked weren’t very good in that format. Fortunately I caught wind of a new format called Commander that featured big creatures, big spells and, most important, nothing rotated out! This was around Innistrad block, so I bought a box and pulled a Gisela, Blade of Goldnight! I quickly built a R/W deck featuring extra combat phases, double strike and damage doublers and was hooked from my first game. My goal with the Dig Through Time series is to use EDHREC to find underplayed cards and hopefully bring you some of the excitement I felt in my early days of Magic. Each article features a set review from a bygone era and highlights cards that I believe are underplayed or undervalued in Commander. This first article focuses on Invasion, which came out in October, 2000. The set is packed full of really cool Commander cards that force interesting choices for you and your opponents that you would don’t expect outside of Conspiracy. 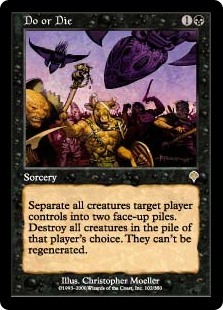 There are also staple cards like Rout. I’m convinced most cards in this set don’t see play because people simply don’t know about them or what to do with them. Let’s dig right into this treasure trove of possibility as I discuss the cards themselves and suggest possible Commanders or other synergistic cards along the way. Finally I have a deck featuring one of the 2016 preconstructed Commanders that I tweaked to feature cards from Invasion. The first card is Divine Presence, a 3 mana pillow-fort style card which EDHREC, at the time of writing, shows is only played in 112 decks. The card comes down early and shuts off a whole series of shenanigans, especially damage-based board wipes like Blasphemous Act, Chandra’s Ignition, or Bonfire of the Damned. 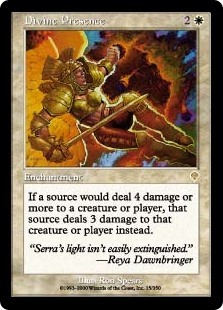 It also neuters beater-style aggro decks, such as Saskia, Prossh, and Xenagos. Voltron decks have a tough time hitting you for 11 Commander damage a turn. Notably, this won’t get around ping and shock damage decks such as Nekusar, the Mindrazer, Purphoros, God of the Forgeor Pyrohemia. 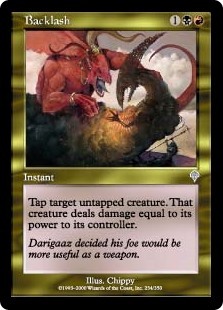 It also won’t prevent the second strike of damage from double strike.This card slots best into life drain decks, such as Athreos or Ayli, that don’t care about damage but focus on draining opponents using Exsanguinate or Debt to the Deathless, as well as other anti-aggro pillow-fort decks like Death and Taxes. Another fun pillow card is Fight or Flight, which sees play in 69 decks. I like giving my opponent two bad choices and watching them sweat. It’s not always optimal, but it throws interesting wrenches into plans. Admittedly, this card is a little hefty at 3W, but it does effect each of your opponents on their combat phase and could slot well into a Kynaios and Tyro of Meletis or Zedruu, the Greathearted style deck. 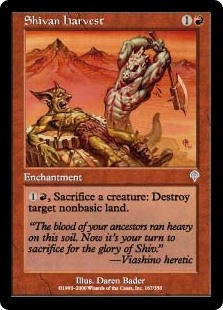 Mass land destruction is a much-maligned strategy in EDH; however, it’s a perfectly valid tactic, so long as you can win within two or three turns of resolving it. Therefore I give you: Global Ruin. This card, currently played in only 80 decks, is better the more colors you’re running since you should wind up with more lands after it resolves than your opponents. Global Ruin could be very effective in a five or four-color decks. Decks with green have the added bonus of being able to run Prismatic Omen to ensure that they wind up with five lands. 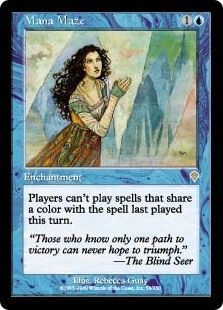 Moving into blue, we have Worldly Counsel, a card played in 19 decks, that should probably be thrown into a few more of the new four-color decks. 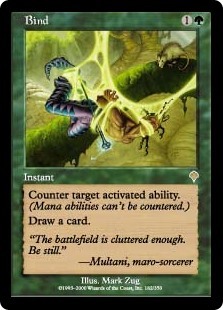 If you can hit three or four land types with Domain, it becomes comparable to an instant speed Ponder for two mana. Granted, it’s not always great in the early game, but who wouldn’t play Ponder for two mana? At the worst, with only two land types it’s comparable to Serum Visions. Repulse just got a reprint in Conspiracy: Take the Crown, which pushed its popularity into 325 decks. This card is pretty good stuff-y. It interacts with certain, very specific cards like Warped Devotion, but overall it’s just a decent bounce cantrip in blue. It pairs well with any spell-slinging commander like Mizzix of the Izmagnus, Talrand, Sky Summoner, or the more recent Baral, Chief of Compliance. Slowing the game down can be a really valuable tool for decks that want to win in the late game. If you’ve ever played against a Vorinclex, Voice of Hunger that somehow resolved, you’ll know just how frustrating it can be to miss out on untapping your lands every other turn. Some decks can play around Vorinclex with mana dorks (Cryptolith Rites, anyone?). Temporal Distortion costs three less than Vorinclex, shuts down dorks and rocks, and sees play in a mere 32 decks. Since it doesn’t care why creatures tap, it also slows down combat, which many blue decks need to do. Run this in decks that utilizes heavy mana rock ramp like Sharuum, the Hegemon or Breya, Etherium Sculptor. 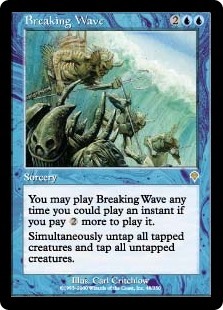 Speaking of mana dorks, Breaking Wave is a fantastic surprise that sees play in a measly 70 decks. 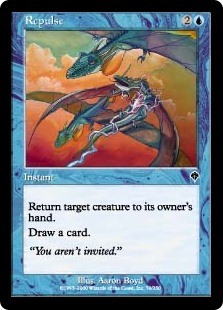 It’s excellent in decks running Simic colors paired with numerous creatures sporting activated abilities. I run Wave in my Prodigal Sorcerer-themed deck, but it also works really well in Kydele, Chosen of Kruphix, for example. In a pinch, this can be an emergency fog effect. Mana Maze is an incredible card currently played in only 129 decks. If you like cards like Ethersworn Canonist, Rule of Law, Eidolon of Rhetoric or Curse of Exhaustion, you might like this card. Kruphix, God of Horizons, Teferi, Temporal Archmage, or Mishra, Artificer Prodigy decks that tend to rely heavily on colorless cards like artifacts and eldrazi really like this card. This card is especially good with Void Shatter, Abstruse Interference, Horribly Awry, Spell Shrivel, Ulamog’s Nullifier, and Brutal Expulsion, since devoid lets you get around the color restriction. Do or Die is half of a one-sided boardwipe for the price of Doomblade, which is played in only 157 decks. I think people overlook cards like this because your opponent chooses which pile to keep, but for two mana this can really upset an opponent’s board. One of the biggest upsides of Do or Die is that you get to stack the piles. You get to separate combo creatures from each other and your opponent gets to choose which one to keep. Decks like Meren of Clan Nel Toth, Sheoldred, Whispering One, or Shattergang Brothers which have strong graveyard synergies may want this card more than others. Yawgmoth’s Agenda is played in 17 decks, which is understandable, since it’s a little bit of a tricky card. Playing only one spell per turn is a significant downside, but having a Yawgmoth’s Will turned on for yourself all the time is a hell of an upside. So what do we put this in? Esper prison decks. 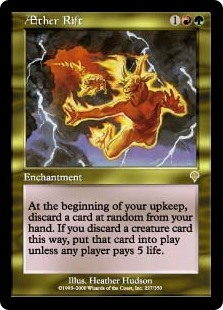 Share that downside with your opponents by playing cards like Rule of Law, Eidolon of Rhetoric and Mana Maze. I’d suggest an Oloro, Ageless Ascetic enchantment lockdown deck. If you run Venser, the Sojourner you can cast your first spell from your graveyard each turn, flicker the Agenda, cast the rest of your spells for the turn (which will now go to your graveyard), and then end the turn, getting your Agenda back. Trench Wurm is a great problem-solver for political plays that is currently played in 28 decks. You can promise to keep boogeymen like Inkmoth Nexus, Gaea’s Cradle, Rogues’ Passage, and Eye of Ugin off the board, while leaving everyone’s color fixing lands alone. Or, you could eschew diplomacy entirely and start picking off your opponent’s only sources of certain colors. 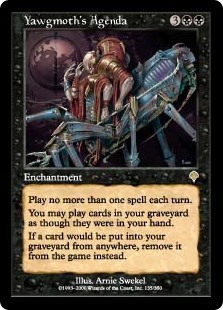 Since it goes in decks that run black and red you have the option of running cards like Reanimate and Anger to keep it around and make it work right away. Speaking of land sniping, take a look at Shivan Harvest, which is run in 324 decks. Let’s say you’re running RGx tokens. Glacial Chasm is shutting down your aggro? Everyone at the table has just allowed Tempt with Discovery’s controller to ramp four lands ahead? Maze of Ith is threatening to keep you off of lethal damage this turn? Drop this little beauty on the board and sacrifice a few of your excess tokens. For maximum efficiency flash in Dictate of Erebos on the end step before your turn. 1R and a token is nothing for instant-speed problem land removal. Try this card in Saskia, the Unyielding, Marath, Will of the Wild, Prossh, Skyraider of Kher, or Shattergang Brothers. 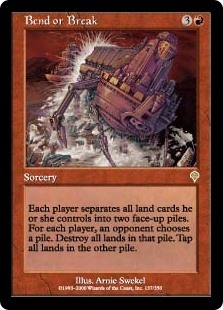 As 95 decks know, political mass land destruction is probably the best kind of mass land destruction. The oracle text on Bend or Break says that you get to choose the opponent that destroys one of your piles. If one player is ramping way ahead, you and another player can put all lands in one pile, and nothing in the other, and choose to destroy the empty pile. Even without a political alliance, this is a great way to catch up to someone ramping ahead in green, without setting you and the other players back too significantly. 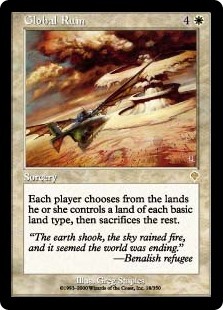 This card plays especially well in lands-matter decks that don’t care so much if their lands get blown up. 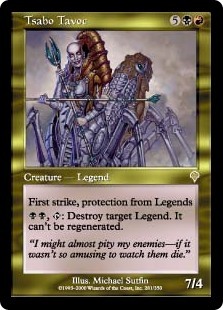 Pair it with cards like Titania, Protector of Argoth Omnath, Locus of Rage, The Gitrog Monster and Splendid Reclamation. actually be useful! Look at Stand or Fall, a card played in just 27 decks. 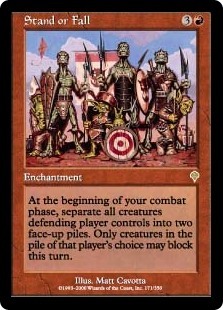 How would you like to take out half of each opponent’s blockers each turn? This card is like super menace that happens to pair well with actual menace. Play it with Iroas, God of Victory, Goblin War Drums, and War Cadence. Go buy one for your Saskia the Unyielding precon (it’s a whopping 18 cents!) try it out and see what you think. Mages’ Contest. Is. Awesome. And only 143 decks are running it! Don’t run it if you’re playing blue, but if you’re not, you should consider this card. Players often overestimate the importance of their spells and often will pressure themselves into bidding too much life to ensure it goes through. There’s no real downside to you since if whatever they’re casting wins the game on the spot, you have nothing to lose going all-in to counter it. 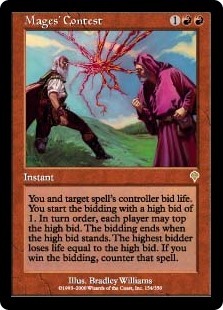 People never expect non-blue counterspells, and this one is a game of “how much life will you pay to resolve that overloaded Cyclonic Rift?” This card is great in RWx decks with lifegain themes like Brion Stoutarm, Bruse Tarl, Boorish Herder + Tymna, the Weaver with Exquisite Blood. You should run Fog in your decks. Tangle is an excellent fog being run in 221 decks. Whatever kind of deck you’re running, keeping your opponent’s creatures tapped down for a turn is a fantastic advantage. Whether you’re playing Derevei, Emperial Tactician lockdown, or Gahiji, Honored One group slug, you want this card. One really fun trick you can do with Tangle is to cast it during the End of Combat step. 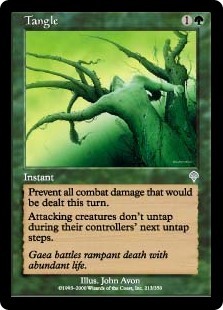 In this step, creatures are still attacking, but damage has already been dealt. If you like where those attackers are pointed, but you want an opening for a lethal swing in the next two turns, let the damage happen, and then cast your Tangle. Bind is a great card, which sees play in 117 decks. It feels really good to counter a fetchland activation. It feels great to counter Sensei’s Divining Top. The sheer joy you feel when countering Tamiyo, Field Researcher’s ultimate. The fact that it’s in green, which is so where you would expect this ability to go, and that it cantrips, is just gravy. 129 decks are answering questions like, “Oh, you’re hardcasting Thromok the Insatiable?” “You’re pumping Atarka, World Render with Xenagos, God of Revels at the start of combat?” “You entwined Tooth and Nail for Blightsteel Colossus and Urabrask the Hidden?” with Backlash. Outside of Grixis, RBx doesn’t really do tricky things. Tap down effects usually come in white or blue. If you haven’t noticed by now, I really like effects that are obvious color pie violations and just a little bit odd to boot. Backlash is all of those things. Is it good? Maybe. Is it competitive? Probably not. Is it awesome? Hell yeah, it is. Tsabo Tavoc is currently played in 117 decks, and her only real downside is her cost. Seven is pretty steep for a black/red deck, even in EDH. But, when you have access to the colors of reanimation and haste-enabling, it could be worth the try. 7 power and first strike should keep most creatures at bay. Protection from legendary is always relevant in Commander. Her activated ability can make your opponents think twice about even casting their commander. 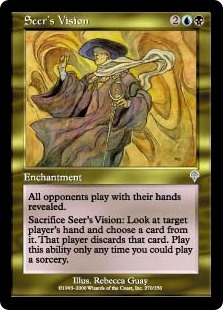 Seer’s Vision is a slightly more expensive Telepathy that offers a nice bonus ability that sees play in 71 decks. Getting to sacrifice it to remove a combo piece, or other choice card is pretty excellent. However, the real value of cards like this is letting your opponents see each other’s hands. People go nuts looking out for their opponent’s boardwipes, counterspells, removal, and threats, while your hand stays out of sight and out of mind. If you’re good at politics, this card can be better than any answer. Your opponents can’t lie and say they aren’t holding a Krosan Grip to get rid of that Mindslaver threatening to lock out the table. The only thing to watch out for is people getting annoyed about mixing their hands up with their permanents. If you hear the table start to get salty, it may be time to force someone to discard. There are plenty of creature-centric decks that would like Aether Rift, but only 25 decks are running it. Prossh, Skyraider of Kher, Kresh, the Bloodbraided, and Ravos, Soultender + Tana, the Bloodsower are all decks that should strongly consider this card, but the one deck that it is criminally underplayed in? Ruric Thar the Unbowed. Ruric Thar is already beating your opponents over the head for 6 damage each time they cast a non-creature spell, they can’t easily afford to pay an extra 5 life on each of your upkeeps to prevent you from getting a free creature. You should keep your hand empty of lands so the ability isn’t a bust, so be sure to run cards like Mina and Denn, Wildborn, Sakura-Tribe Scout, and Skyshroud Ranger. Glissa, the Traitor is a rattlesnake of a card that some people run in 893 decks (more decks than the number of decks she commands) just for the combination of deathtouch and first strike. 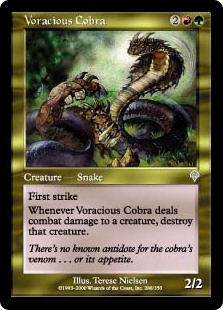 Voracious Cobra is a real snake with the same abilities, that gets played in just 30 decks. Red/Green aggro generally wants to attack each turn with all of their creatures, but doesn’t have very many defensive options, outside of fog effects. 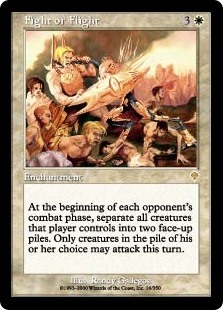 For 2RG you can keep most archetypes, other than token swarm, pointed at other targets. I’m always looking for cards that tax my opponents. If Tabernacle at Pendrell Vale is outside of your price range, Vile Consumption might be for you. Seeing play in only 111 decks, Vile Consumption comes down early. The fact that it’s an enchantment makes it a little bit harder to remove, which is nice. 40 seems like a lot of life, and 1 life seems like so little. Your opponents are usually, foolishly, too willing to pay the tax to Vile Consumption. 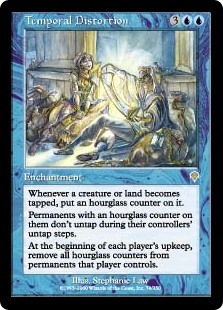 This would go into any drain deck that’s either light on creatures, or gaining more life than it has to pay to Consumption. 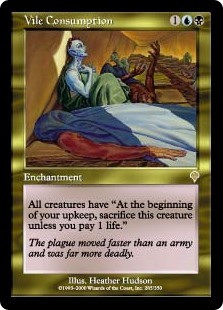 Consider it for decks like Oloro, Ageless Ascetic or Nekusar, the Mindrazer. Recoil is another nice, general-use bounce spell that could stand to see more play than the 253 decks that currently run it. It’s fine as a good stuff card. 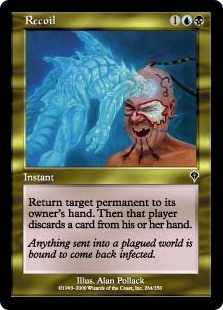 It’s just a slightly more expensive Boomerang that also forces your opponent to discard, but if you’re in a discard themed deck, and can get your opponent hellbent, this card reads “put target permanent into its owner’s graveyard.” This card is especially nasty in decks like Leovold, Emmisary of Trest, Crosis, the Purger, or Nicol Bolas. 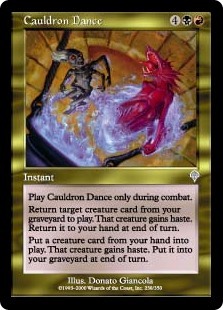 Seeing play in 364 decks, Cauldron Dance is such a weird, powerful card.There’s nothing else quite like it, it’s kind of like Through the Breach meets Postmortem Lunge. At instant speed, it’s a nice enabler for enter the battlefield triggers. Also, while it doesn’t even touch Tooth and Nail, it can be a combo enabler for cards like Mikaeus, the Unhallowed + Triskelion, or Kiki-Jiki + Zealous Conscripts (but you wouldn’t run those boring combos anyway, would you?) In a very bad pinch, Cauldron Dance gives you two emergency blockers. Those are my top picks for best hidden gems in Invasion.The set is full of fun, interactive cards that are sure to liven up your games. Hopefully you’ll consider some of them in your next deck build. I tweaked one of the Commander 2016 decks to showcase some of the cards we discussed. This deck is aggressive, with a side of disruption and control, and I hope it whets your appetite for our next set review where we take a look at Mercadian Masques.